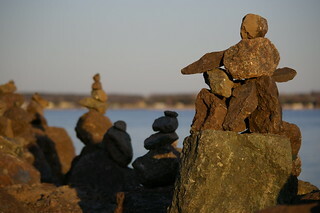 For the past few summers I've noticed that people are constantly making these little inukshuks along the boardwalk in Victoria Park, although I've never actually seen anyone doing it. On Sunday I was out for a drive with a friend and we went through the park and I saw these being carefully constructed by a young woman. Unfortunately I didn't have my camera on me (which I'm now kicking myself for) and by the time I got home to get it and returned she was gone....but now I know she was here.